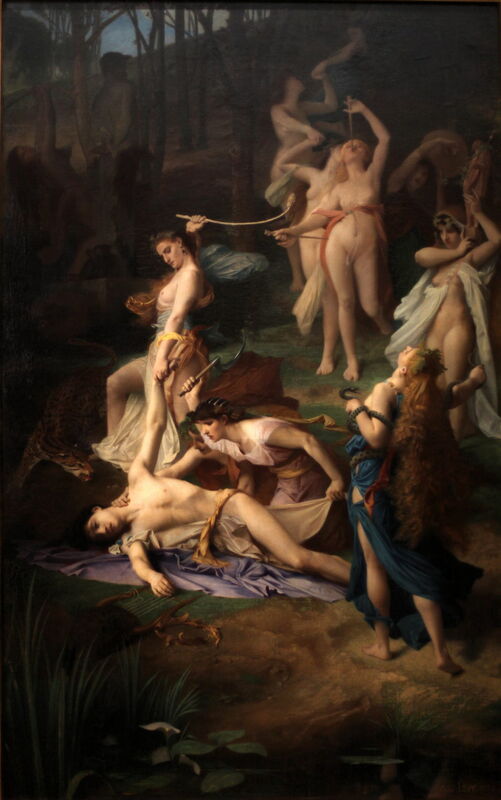 Émile Lévy (1826–1890), Death of Orpheus (1866), oil on canvas, 189 x 118 cm, Musée d'Orsay, Paris. Wikimedia Commons. Having introduced Tiresias to us as a seer, and after taking a short break from the Theban cycle, Ovid’s last story in Book 3 of his Metamorphoses involves a prophecy from Tiresias about Theban events, which lead to a grizzly murder. This story opens with a two-line summary, in which we’re told that one man scorned the gods and Tiresias: Pentheus, son of Echion, who was one of the founding Thebans born from the dragon’s teeth sown by Cadmus earlier in this book. Pentheus mocks Tiresias for his blindness, in return for which Tiresias warns him that he would be better off blind. The seer then foretells that a new god, Bacchus, son of Semele, will soon arrive. If Pentheus does not worship him, then he will be torn apart, limb from limb, by his own mother and aunts. In the next lines, Bacchus and his cult arrive. Although everyone else is immediately engaged in his celebration and worship, Pentheus pours scorn on the new god and those rites. Pentheus is highly critical, warning that the city of Thebes could fall to an unarmed boy while its citizens engage in Bacchic festivities. Pentheus orders his men to bring him Bacchus, but they return only with one of his followers. The captive is invited to tell his story before being put to death. Acoetes, as he names himself, describes his upbringing, and career as a ship’s captain. On one journey, he put his ship in to Chios, where his crew found a young boy who seemed to be partly drunk and dazed. Against his better judgement, his crew brought the boy aboard his ship. his hardened skin was covered with bright scales. displayed a tail, as crescent as the moon. Bacchus told Acoetes to sail on to Naxos, where the captain joined Bacchus’ cult. Pentheus then orders Acoetes to be tortured until he dies. But while he awaits his death in a cell, the doors suddenly fly open, his shackles fall away, and he escapes unharmed. Pentheus decides to deal with this himself, and heads for Mount Cithaeron, where the Bacchic revels are taking place. He finds the worshippers in a clearing on the wooded slopes. As he gazes at the forbidden sight of the ‘mysteries’, he is seen. His own mother, and her sisters, mistake him for a boar, and immediately attack. Pentheus invokes the name of Actaeon in a desperate bid to stop the throng of bacchantes who attack him, and tries to run away, but it is futile. His arms are torn off, and then his head. Ovid ends the story with the lesson that the women of Thebes will honour Bacchus in those rites, and cannot be stopped. There is an interesting historical link, as during the history of Rome, the cult of Bacchus and its ‘mysteries’ were a source of concern to its government. Around 186 BCE (almost two centuries before Ovid’s prime), attempts were made to control or stop those practices. They do not seem to have eliminated Bacchic cults or revels, but absorbed them better into society, which is perhaps the solution which Pentheus should have sought. The story of Pentheus is also unusual in Metamorphoses in that its only transformation occurs in the embedded story of the ship carrying Bacchus to Naxos, in which the crew are turned into dolphins. Its theme or moral, of not looking at what shouldn’t be seen, does though fit in well with Ovid’s stories in this book. This story is shown in at least two surviving works of art from ancient times, but since the spread of Christianity, has all but vanished from art. Artist not known, Pentheus Torn Apart by Agave and Ino (c 450-425 BCE), Attic red-figure lekanis (cosmetics bowl) lid, diameter 25.4 cm, Musée du Louvre, Paris. Image by Jastrow, via Wikimedia Commons. This Attic red-figure lid for a cosmetics bowl, from about 450-425 BCE, shows Pentheus about to be torn apart, limb from limb, by Agave and Ino, his mother and aunt. 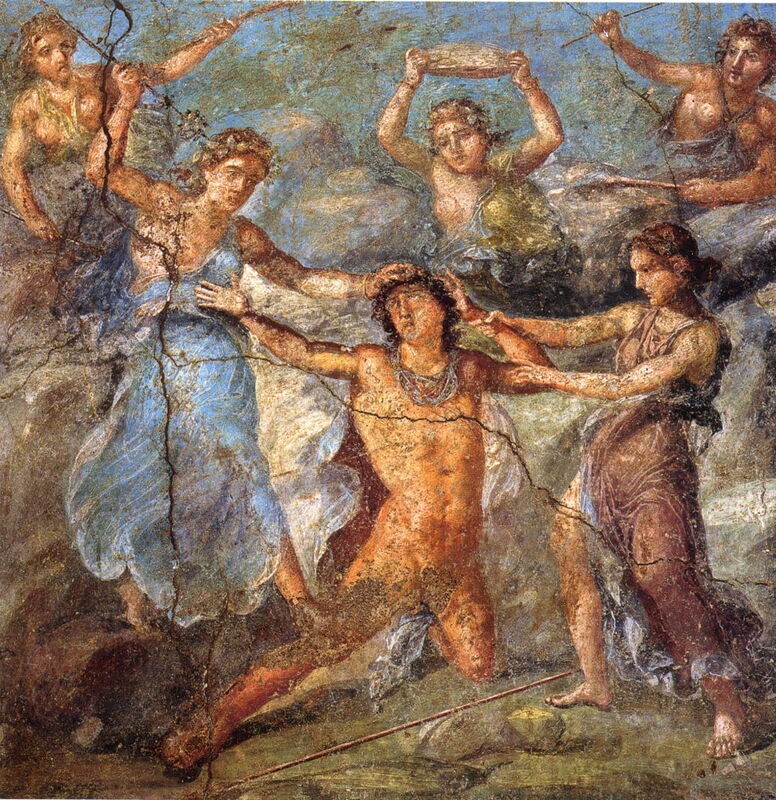 Artist not known, Pentheus Being Torn Apart by Maenads (before 79 CE), fresco, northern wall of the triclinium in the Casa dei Vettii (VI 15,1), Pompeii, Italy. Image by WolfgangRieger, via Wikimedia Commons. This fresco found in the ruins of one of the houses in Pompeii shows a similar scene, here with his mother and an aunt preparing to rip his arms off, another woman behind him about to throw a large rock, and two others wielding their thyrsi like clubs. As far as I can discover, the only painting of Pentheus and his death which has been made since, up to 1950, was a mid-nineteenth century history painting by Charles Gleyre (who taught several of the Impressionists to paint). Sadly I have been unable to locate that, or any usable image of it. There are hundreds of paintings from the Renaissance onwards which show Bacchic revels and bacchantes. Among the most famous are several by Poussin, for instance. Almost universally, they show feasting, drinking, and free sexual activity. 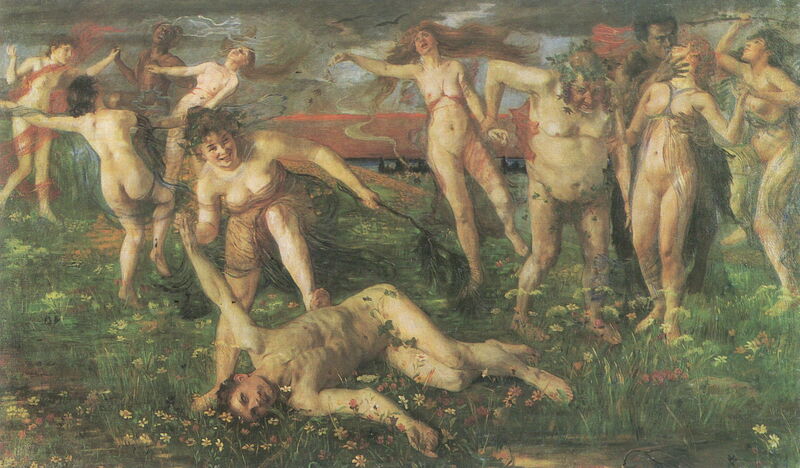 One of my favourite paintings of this type is Lovis Corinth’s Bacchanale (1896). Shown at the Salon in Paris in 1866, Lévy catches the moment before the first wound is inflicted: Orpheus has just been knocked to the ground, and looks stunned. Two bacchantes kneel by his side, one clasping his neck (almost as if feeling for a carotid pulse), the other about to bring the vicious blade of her ceremonial sickle down to cleave his neck open. Orpheus was the great legendary musician, who shunned the worship of gods other than that of the sun. Early one morning, when he went to the oracle of Dionysus/Bacchus at Mount Pangaion to salute the rising sun, a group of bacchantes were enraged by his refusal to honour their god, and tore him to pieces. So why has no one painted the dramatic story of the death of Pentheus? I’d hazard a guess that its underlying lesson was too anti-Christian for any patron or painter to try to tell it in a painting. Lévy succeded in doing so for Orpheus because of the latter’s musical accomplishments; Pentheus had no saving graces, and any depiction could only have appeared an endorsement of extremely heathen revels – which were only acceptable when they resembled the activities of contemporary Christian courts, perhaps. But as an encouragement to tolerate or even encourage the worship of a profoundly heathen god, they would have been wholly unacceptable to European society. Posted in General, Language, Life, Painting and tagged Bacchus, Corinth, Gleyre, Lévy, Metamorphoses, myth, narrative, Ovid, painting, Pentheus, Tiresias. Bookmark the permalink. File problems in iOS 10.3 and macOS 10.13: What’s in a name?